Categories Record categories / Sales catalogue Synth' Pop Albums David Bowie - "Heroes"
"Heroes" is the twelfth studio album by English musician David Bowie, released on RCA Records on 14 October 1977. The second installment of his "Berlin Trilogy" recorded with Brian Eno and Tony Visconti, "Heroes" continued the ambient experiments of Bowie's previous album "Low" (released earlier that year) and featured the contributions of guitarist Robert Fripp. Of the three albums, it was the only one wholly recorded in Berlin. Upon its release, it was met with positive critical reception and was named NME Album of the Year. The title track remains one of Bowie's best known and acclaimed songs. The album was included in the book 1001 Albums You Must Hear Before You Die. Recorded at Hansa Tonstudio in what was then West Berlin, "Heroes" reflected the zeitgeist of the Cold War, symbolised by the divided city. Co-producer Tony Visconti considered it "one of my last great adventures in making albums. The studio was about 500 yards [460 metres] from the Berlin Wall. Red Guards would look into our control-room window with powerful binoculars." Earlier in 1977, Kraftwerk had name-checked Bowie on the title track of Trans-Europe Express, and he again paid tribute to his German progressive rock influences: the title is a nod to the track "Hero" on the album "Neu! '75" by the German band Neu – whose guitarist Michael Rother had originally been approached to play on the album – while "V-2 Schneider" is inspired by and named after Kraftwerk's Florian Schneider. The cover photo by Masayoshi Sukita was inspired by German artist Erich Heckel's "Roquairol". Brian Eno instigated Robert Fripp's involvement by telephoning him in New York and inviting him to play guitar on the album. Fripp had considered himself retired from music but said, "Well, I don't know because I haven't played for three years, but if you're prepared to take a risk, then so am I." Upon arriving at the studio from New York, and suffering from jet lag, Fripp recorded a guitar part for the track "Beauty and the Beast": this first take was used in the song's final mix. Although "Heroes" continued Bowie's work in electronic and ambient music styles and included a number of dark and atmospheric instrumentals such as "Sense of Doubt" and "Neuköln", it was regarded as a highly passionate and positive artistic statement, particularly after the often melancholy "Low". The lyrics for "Joe the Lion", written and recorded at the microphone "in less than an hour" according to Visconti, typified the improvisational nature of the recording. RCA Records marketed "Heroes" with the slogan "There's Old Wave. There's New Wave. And there's David Bowie ..." It enjoyed a positive critical reception on release in late 1977, Melody Maker and NME both naming it "Album of the Year". It reached No. 3 in the UK and stayed in the charts for 26 weeks, but was less successful in the US where it peaked at No. 35. The album was released in Germany with the title track renamed ""Heroes"/"Helden"" and partly in German. An early instance of the album's enduring influence is John Lennon's comment in 1980 that, when making his album "Double Fantasy", his ambition was to "do something as good as "Heroes"." Rolling Stone highlighted Eno's contribution, contending that after Bowie's "auteurist exploitation" of the former on Low, "Heroes" "prompts a much more enthusiastic reading of the collaboration, which here takes the form of a union of Bowie's dramatic instincts and Eno's unshakable sonic serenity". Several songs from the album were played live on Bowie's Low and Heroes World Tour of 1978, and released on the live album Stage in the same year. Philip Glass adapted a classical suite, "Heroes Symphony", from this album as a companion to his earlier "Low Symphony". The title track has been covered by numerous artists, for example as an encore by subsequent incarnations of King Crimson, and Billy Mackenzie sang "The Secret Life of Arabia" in 1982 for the British Electric Foundation LP "Music of Quality and Distinction". Several tracks were used in the film Christine F. Bowie performed as himself in the film. 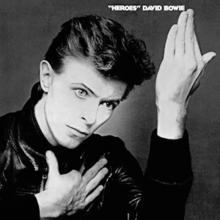 The cover of Bowie's 2013 album, "The Next Day", is an altered and obscured version of the "Heroes" cover. This version has "Heroes" crossed out and Bowie's face obscured by an opaque white box reading "The Next Day". RCA PL 12522 stereo (1977). This record for sale is a Spanish 1st pressing RCA PL 12522.